Neo SC-19 ... Rust in Piece? Received a SC-19 from Ronnie yesterday. Tube is great, lovely picture. Hood is in good shape too. 4-Slot is faulty - not sure that we found someone in the UK to fix these, fortunately I already had another 4 Slot. Some ugly dents on bottom corners of cab and some holes too. There is SEVERE corrosion around the rear inner top edges of the cab going down one of the corners, there is also severe corrosion internally on the cab floor and other areas, including under the paint at the back of the cab. It is likely that a new piece of metal will be needed along the top and perhaps a new floor will also be required. The key issue is how much rust has eaten away at the rest of the internal supporting structure. I have yet to remove the monitor to fully inspect it. Before I take out the monitor I note that there does not seem to be any quick disconnects for the leads going to the monitor chassis. I can see that there are a number of plugs on the chassis, but it doesn't seem feasible to disconnect these before removing the monitor, as they are difficult to get at. At the same time I doubt the wires will stretch to allow me to disconnect them after I have lifted it out. I confess that I have not completely inspected the loom and all the power connections inside the cab, so hopefully I can remove the cables from plugs at that end. 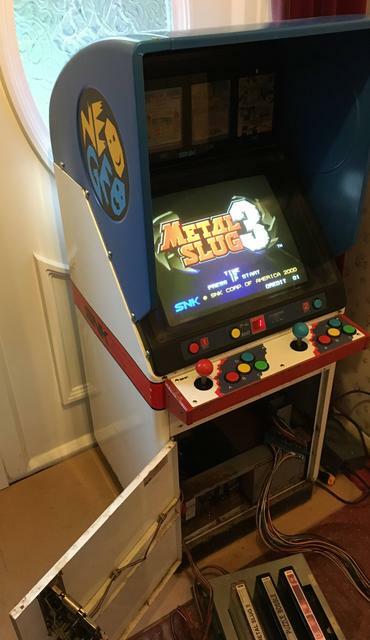 I thought I would be getting a nice project cab, if it was the case that I was dealing with some surface rust and a few holes to be patched, that would be one thing, but this is going to be a massive job, and I am quite close to conceding that the shell is a write-off. Re: Neo SC-19 ... Rust in Piece? Luckily it doesn't look bad from the outside. ...and the hood looks intact. Replacement of internal metalwork shouldn't be too much of a problem and if the structural integrity of the outer shell isn't weakened it may be better to just clean it up and treat the rust. It was looking grand till I started to take bits off. yeah what yosai said rust is treatable and at least there is a template to work with and unlike car sills and the likes shouldn't be too complex. Is it crumbling? Weaken From what you've seen? It can be harder deal with some awkward dents at times than rust and at least the hood is good. Looking forward to seeing the progress. Completely strip the cab down, taking plenty of pics as you do it, if you have one use an ultrasonic cleaner on all the nuts/bolts fastenings you plan to re-use. Wirebrush off all the loose rust, clean it down and assess how bad the shell is from that point. You may get away with a decent rust converter/treatment, followed by a thin coating of car body filler or filler/primer. Or there's always fiberglass matting. Once the damaged areas have been repaired and the dents knocked out (use same technique as getting dents out of car panels). then the major decision needs to be made - touch-up, respray or powder-coat. From personal experience do not get distorted, filled or thin metal panels powder-coated - thin ones warp and filler can drop out when the powder gets baked, also it doesn't cover dimpled surfaces well and can make it look worse. Check and double check any sideart, stickers etc are available as reproductions. If they are strip the cab right back to bare metal/filler etc and get it sprayed at a car body shop, it'll save you loads of heartache and irritation for every imperfection you'll see in the paint finish. If not mask it up and touch up what you can, I've rattle-can'd entire cabs before and the finish has been OK. Here is a pic of the inside bottom of the cab, will shortly be taking out the monitor. The only thing delaying me at the moment is not having a space indoors to totally strip it apart and start working on the rust. I should be able to take the shell outside to remove the base and to work on it (then bring it back in), but am just hanging fire as the weather is going to be nasty over the next week or so. I might be able to use another space, but we shall see. I am quite eager to work on it despite it's sorry state! I've worked on worse cabs than yours and got them looking OK. The rust doesn't look to structurally damaging. Worst case scenario - find someone local that does sand-blasting that knows how to do car panels (heavy duty sand-blasters can make hell of a mess of the metalwork and blow holes in thin sections). best £30 I spent on one of my cabs, dropped the panels off Monday, collected them all paint & rust-free on Wednesday. 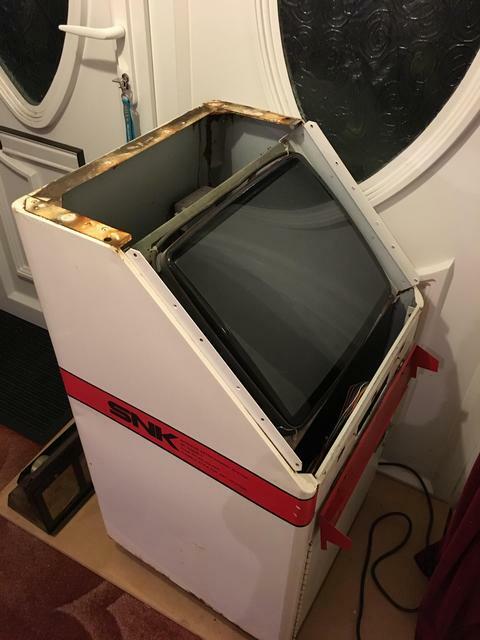 Dropped them off at the powdercoaters Wednesday, picked up a nice white Pony-II 25" on Friday - total cost £80 and the only thing I had to do was strip the cab apart and reassemble it. Obviously if you have dents and rust holes to sort then I'd fill & smooth, then take to a car bodyshop to get it sprayed as you'll get a much smoother finish that way. Did you buy if knowing it had all that rust? It was advertised as 'some rust damage', I asked about holes due to rust and was advised that it had some on the base of the cab. It's only upon dismantling that the full extent is revealed. Its not great buddy, but truthfully a lot of what is shown here can be treated, as others have said. There are loads of products that kill the rust, often turning it black then back to metal. You will then need to file/sand/wet'n'dry the metal back and it'll be ready to coat again. Sand blasting might just make some of the damaged areas even worse if its fragile. At least its the hidden areas I guess, but as I say, its doable... but time consuming by hand. It doesn't seem as bad as when I first saw it, and it may take some time, but little by little I am working slowly on it. (bear in mind that this is the 'good' angle). Today I removed the monitor and took it down to Grant's. That gave a me a good opportunity to have a good nose around, I took the pic above after my initial hoover up, then i went at the areas with a wire brush attachment (then had to hoover some more) ... forgot to take an 'after' picture, although I was mainly going at the areas at the top that had the most crusty stuff on them. I took the internal cross members outside and worked on those more intently, during the week I will sand them, then treat them, I will probably also pick up some of that hammerite treat and prime paint as a last step, I will do that for the internal removable bits and pieces - coin box and coin box casing. I will also try to do some more work on the shell (inside), until i reach a point where i need to get it painted and get the top lip replaced. - This step may be some time, as at some point I will also need to split the body from the base. If it were summer I would take a week off and do it all in the garage, but, like I said, I will work at it little by little. Also I got a box with some little boxes labelled for all the screws. Think I will try to buy new fixings, as the current ones are too far gone to be cleaned with one of those machines I think. An ultrasonic cleaner won't sort out the fixings, but a good vinegar bath would work wonders. I’ve had great results with vinegar and a microwave. I have a bodyshop lined up for the welding that needs to be done. Whilst I have been working on clearing up the rust (and it has not been too bad), they may as well do the whole job on the shell. About the side art, I note that the AO Wiki has the files, presumably these can be printed out via a pro printer (or maybe Muddy)?